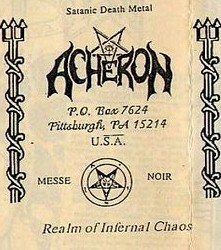 ACHERON marked their arrival with the live 1989 demo tape ‘Messe Noir’. 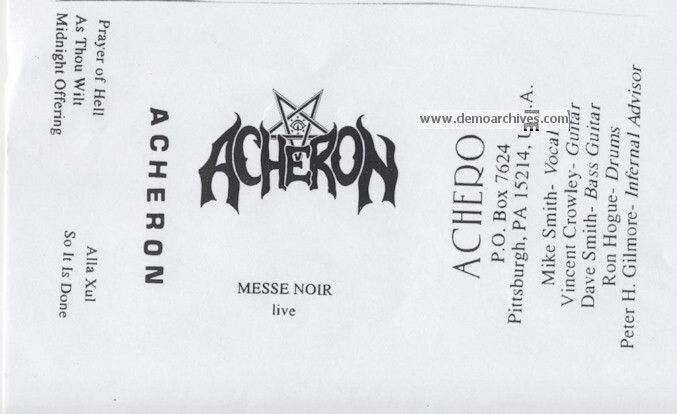 At this juncture ACHERON comprised singer Michael Smith, guitarist Vincent Crowley of Nocturnus, bassist David Smith and drummer Ron Hogue. 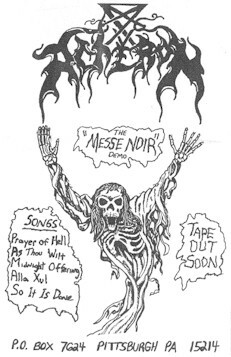 These recordings would later see a 1995 release on 7inch single format by Reaper Records limited suitably to 666 copies. Xeroxed covers. No lyrics and recorded onto regular non studio tapes. Not the same recording as the full length album of the same name with similar tracklisting. Xeroxed covers. No lyrics and recorded onto regular non studio tapes.